The Cluster HAT basically comprises of a USB 2.0 hub and independent I2C or GPIO controlled power for each Pi Zero (and Alert LED). 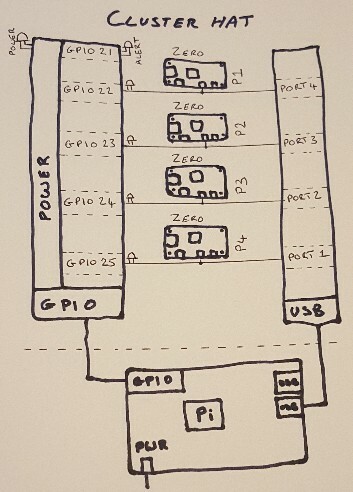 When looking at the USB ports used for the Pi Zeros in "lsusb -t" you will see they're not connected USB Port 1->P1, they are connected as follows. Knowing this can be useful when checking you have the correct image on the SD card for example. N.B. GPIO pins 22-25 DO NOT power the Pi Zero directly they are only used for control. From the Controller Pi power to the Pi Zeros can be controlled using the "clusterhat <action> <devices>" command on our configured images. If you're not using our images you can download our clusterhat script (may need modification for your configuration) or use i2cset/gpio(wiringpi tool) to directly toggle the I/O expander or GPIO pins. In the command line examples below we're using the i2cset tool. You can use other commands/languages to communicate with the I2C expander such as C, C++, Python, etc. To follow the examples install the command line tool. As the Cluster HAT is controlled by I2C you must first ensure I2C is enabled in the kernel. On Raspbian based distributions this can be enabled using raspi-config. Depending on availability we currently use XRA1200P and PCA9554 I/O expanders (datasheets linked above), the registers 0, 1, 2 and 3 work in the same way for both of these devices. Controlling the Cluster HAT using the I/O expander is a little more complicated vs the GPIO interface used by the Cluster HAT v1.x but allowed many new features to be added. Here we're only showing the basics of initial initialisation, turning on/off Pi Zeros, HUB and ALERT LED. To initialize the I/O expander the "direction" register needs to be set but care is needed in case the POS (power on state) jumper has been cut (to automatically power on the Pi Zeros). If you don't need to check this you can jump to the "Set all pins on the I/O expander to outputs" section below. First check if the direction register is still set to it's default value 0xff (has the I/O expander been initialised). If the value is not 0xff then the expander has been initialised so skip directly to controlling power to the Pi Zeros below. If the direction regiser is 0xff you will need to read the logic levels on the I/O expander pins to detect POS. If the low nibble of this value is an 'F' (0x?F) it means all Pi Zeros are powered on and the POR jumper has been cut so all Pi Zeros need to be powered on before setting the expander pins to outputs. Set all I/O ports to be outputs. Then ensure the USB hub is powered on. For a Version 2.0 the HUB bit (5) needs to be set to 1, for versions >2.0 the bit needs to be set to 0. The above i2cset command options can be broken down as. "-m $((2#00100000))" - is the mask of which bit(s) to set (here we're using bash to convert from binary to decimal. If you know the decimal or hex you can set this directly as "-m 64" or "-m 0x40" for example). "1" - is the I2C bus we're communicating on. "0x20" - is the address of the I/O expander. Then we use either "0x00" (to set the bit(s) set to 1 in the mask to 0) or "0xff" (to set the bit(s) set to 1 in the mask to a 1). We use the mask option (-m) to i2cset which first initiates a read of the specified register, this value is then masked and written back to the register it was read from. With the above commands this enables you to toggle single bits on the I/O expander without having to manually read the value first and calculate the value needed to toggle a single bit. Once the USB hub is powered on you can control the Pi Zeros. Similary the ALERT LED can be controlled by setting bit 6 high(on)/low(off). For full details please see our standard clusterhat script which detects the pullups on P1/P4 to detect initial power on state, turns all LED on/off, etc. The WiringPi tool is normally installed on the Cluster HAT images but if you're using another distribution you may need to install it to use the examples below. The Controller GPIO pins are automatically configured by the Cluster HAT to be outputs so the Pi Zero power can be enabled/disabled using simple commands. The above commands can be used in scripts to turn on/off and cycle the power to each Pi Zero individually. We advise staggering the power up of the Pi Zero by a couple of seconds to stage the increase in power requirement on your power supply.